Honeybees are relatively quiet and almost cute as they go about their work. 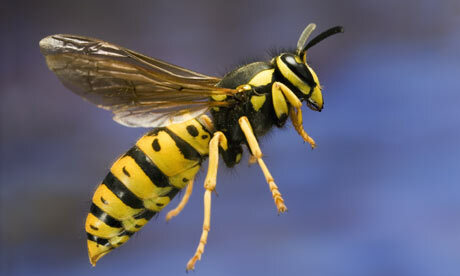 Wasps, hornets and yellow jackets, on the other hand, are noisy and aggressive. People don’t like them because they build nests near homes and can damage shrubs and trees. Mostly, though, people are afraid of their painful stings. All About Wasps: Wasps live everywhere except Antarctica. But wasps have a useful purpose. Wasps are fierce predators and they hunt and eat almost every insect pest that harms crops. 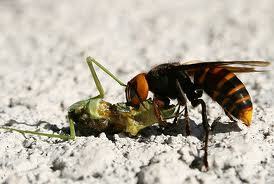 Wasps eat grasshoppers, aphids, flies and other bees. They also eat nectar, tree sap and fruit. Some wasps eat human food, which is why they can be a nuisance at picnics. Wasps make nests from paper. Wasps live everywhere but Antarctica. Wasps can sting over and over again. Wasps make nests from paper. They chew up strips of bark and spit it out again to form a rough paper. Some wasps make nests in basements, sheds or dark, cool places. A queen starts a new colony each spring. She raises a few worker wasps first to make the nest larger and bring food. Then she starts laying eggs. 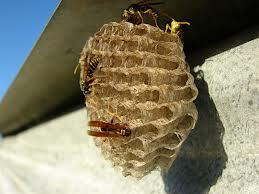 A colony can grow to 50,000 wasps in one summer. In the fall, all the wasps die except for a few new queens. The new queens spend the winter in an old log or burrow. In the spring, they make new colonies. A queen starts a new colony each spring. Wasps eat grasshoppers, aphids, flies and other bees. A documentary of the wild lives of the Japanese hornets. Question: Do all wasps live in colonies? Answer: Some wasps live alone. Question: Do wasps make honey? Answer: Only honeybees make honey. 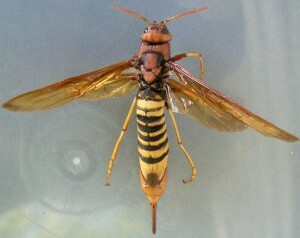 Enjoyed the Easy Science for Kids Website all about Wasps info? Take the FREE & fun Wasps quiz and download FREE Wasps worksheet for kids. For lengthy info click here.